Is Heisenberg a Defeater for an Evidentialist Epistemology? A major problem that presses my theory of knowledge is the Heisenberg Principle. This principle states that an observer changes the current state of affairs being observed. For instance, if I am measuring the velocity of a particle I cannot know the position of the particle and vise versa. This is called uncertainty. How this comes into the epistemic process is whether or not this principle is epistemic or ontic. This uncertainty creates an epistemic limit. If this principle is epistemic then what relationship does the nature of reality have on our epistemic faculty? Heisenberg himself believed that this uncertainty was not merely epistemic but it was ontic. Back to the example of velocity and position, if Heisenberg’s ontic uncertainty is true then if an object that is not in an eigenstate of position then the object does not have a position. Position then becomes a potential property. When the observer measures the position it is then actualized. If this principle is ontic then this may potentially be a defeater for my position. By way of realism, there is a certain element of reality that truly is uncertain. Causation is even worse than what Hume told us. That is still not to say that causation does not occur, it must, but this ontic uncertainty may affect more than just the quantum world. If all of reality is composed of particles then there is a certain extent to which properties of particle can be extrapolated to a set aggregate of particles. It’s easy to see how this can affect evidence and meeting sufficiency for belief. I do not believe that ontic uncertainty makes reality unknowable since, intuitively, there are some propositions that we do know to be true such as the reality and existence of the external world. So, even if it were the case that there is an element to ontic uncertainty it would not affect my epistemic theory in a capacity that would render it void and untenable. There may be minor nuances to my theory that would render this theory questionable but given epistemic charity or probability one may still be justified in believing any proposition that is onticly uncertain as true as long as it meets the criteria for sufficiency. Both the natural sciences and Christian theology are to engage with the nature of reality—not deciding this in advance, but exploring and establishing it through a process of discovery and encounter. Alister E. McGrath, The Science of God: An Introduction to Scientific Theology (Grand Rapids, MI: Eerdmans, 2004), 21-22. An eigenstate is a state corresponding to a fixed value of a physical variable. Jonathan Allday, Quantum Reality: Theory and Philosophy (Boca Raton, FL: CRC Press, 2009), 250-251. This is a guest blog post by Greg West. Greg is an apologist and founder of The Poached Egg, a Christian worldview and apologetics journal where theology, science, philosophy, history, and pop culture collide. 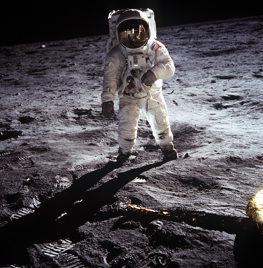 On July 20, 1969, Apollo 11 was the first manned spacecraft to land on the moon. Hours later, Neil Armstrong became the first man to walk on the lunar surface. Or did he? You see, I personally don’t believe that man has ever been to, or let alone walked on the moon, because there is no proof and very little evidence in support of it. As a matter of fact, there is every reason to believe that the whole thing was a hoax, and that Neil Armstrong probably never even actually existed (I know you’re thinking, “Uh, Greg, Neil Armstrong is still alive”, but I’ll get back to that later). The cold war was in full swing back in 1969 and we were in a race with the Soviet Union to see who could get to the moon first, and it was starting to look like the Soviets were going to win. This is why the President, congress, NASA, and the news media got together and decided to fake the whole thing. After all, our national pride was at stake! I realize that many of you think you saw the whole thing on TV and that millions of other people did too; it even made Walter Cronkite cry while he was doing live coverage of the alleged moon landing. What you saw on TV was actually taking place at a secret soundstage made to look like the surface of the moon, and special effects were used to make it look like the astronauts were semi-weightless. This was all done because the perpetrators of the conspiracy knew that we were not going to beat the Soviets to the moon, so they wanted you to believe that we did to save face. Also, did it ever occur to you that maybe you just believe that we’ve actually been to the moon because you were brought up in the U.S. where you have been culturally indoctrinated and raised to accept the moon landing on faith? If you were to visit the remote tribal people of the Amazon Jungle, point at the moon and tell them that men have walked on it, they would probably look at you like you were nuts. They might also consider having you for dinner. Some of you young people may have heard your parents or grandparents talk about how they saw the moon landing on TV and go on and on about how awesome and inspiring it was; but have you ever seen this so-called “actual” footage? It is so grainy and scratchy that it’s really hard to tell what you’re supposed to be seeing, and it is hardly convincing. When speaking with these alleged eyewitnesses, they will tell you what a moving moment it was and how it changed their lives, but you know as well as I do that this kind of experience is 100% percent subjective and not empirically provable by science. Everyone just wanted to believe so much that a man could walk on the moon, that they bought the lie hook line and sinker, and have convinced themselves that they actually witnessed a man walking on the moon. As I mentioned before, Neil Armstrong probably never even actually existed. He was a person that the conspirators “made up” to help people feel good, sort of like Captain Tuttle in that one episode of M*A*S*H*. I know that there is a living person who believes that he is the-first-man-on-the-moon Neil Armstrong, but this person was actually born in a laboratory, raised in a bubble, and was brainwashed and hypnotized to believe that he actually walked on the moon. An alternate theory, which has some credible evidence, but not as much as the former theory, is that the real Neal Armstrong was paid a large sum of money by the government to keep quiet, went into the witness relocation program, and eventually ran off to Istanbul where he married a belly dancer named Maggie. One final piece of evidence that proves the moon landing was a hoax is that the cable television show Myth Busters did an episode were they supposedly busted the “myth” that the moon landing was a hoax. I saw that episode and they really didn’t prove anything, not to mention the fact that they were paid a lot of money by the government, and were given access by NASA to super-secret technology to help them pull it off. In Obvious Hoaxes Part Two we’ll examine why some people are so gullible as to believe that the Bible is actually true. Greg’s Note: The above article is satire at best or pure sarcasm at worst. It might be a little of both, but I can’t prove it either way.